In an effort to continue my quest to cover the best music festivals across the Midwest I braved the hipsters, bad weather, and plumes of Juul smoke in order to experience the fourteenth iteration of the Pitchfork Music Festival in Chicago. The festival takes place in Union Park near the city’s west side, just past the trendy, restaurant-focused West Loop neighborhood. The festival boasts three stages; red, blue, and green, that hosted over 40 acts by the time the weekend reached its conclusion. Though I was only able to experience the festival on Friday, I can honestly say it is was one of the most well-run experiences that I have had. Due to the on-and-off rain in the morning, I did not arrive at the Union Park until a little after 2 p.m. As I exited my Uber, I could hear the final squalls of Chicago noise rock four-piece Melkbelly’s set as I made my past the press tent. The first set I got to see in earnest was indie songstress Lucy Dacus. The soft-spoken Virginia native ran through a collection of songs primary from her new album Night Shift which was released earlier this year. It was a nice amuse bouche — a palette cleanser — for all of the bigger, louder, and more exciting sets to come over course of the day. Julia Byrne put on a beautiful set on the festival’s blue stage. The blue stage, the smallest of the three, was tucked into the vegetation-covered southwest corner of the park. It is a quiet and intimate space which made it perfect for Byrne’s delicate music. With the wind and the rain, it was almost impossible to decipher her lyrics, but her gentle Spanish-inflected strums and nimble finger picks were wonderfully complemented by her band that included violin, mini mellotron, and harp. After Byrne’s set came to a close, I headed over to the red stage and caught the last chunk of Natural Information Society. Fronted my African lute player Joshua Abrams, the band plays a mishmash of jazz, avant-garde, and noise rock. It honestly seemed as though the entire performance was composed of a single, constantly-changing piece of music that I went from loving to hating to making peace with in the 20 odd minutes I was there. It was the musical equivalent of going through the stages of grief. Former Odd Future rapper Earl Sweatshirt was originally tapped to play the festival’s green stage for an afternoon show but after a late cancellation, he was replaced by Philadelphia MC Tierra Whack. Whack, who recently released a 15-minute audio-visual album titled Whack World was an absolute ball of energy for the 30 minutes that she performed, jogging across the stage and asking the crowd to repeat her last name and a number of strange bodily noises. Saba, the Westside Chicago native and Chance the Rapper affiliate, gave a wonderful homecoming show full of cuts off of his excellent release Care For Me. Dressed in a shirt that says “I Met Saba” on the front and “He Cares For Me” on the back, the rapper pinged across the stage, making sure to mix it up with his band members along the way. Whether he was singing about his addiction to the wrong kind of women (“Broken Girls”), early scraps growing up in the neighborhood (“Fighter”), or the dangers of being too invested in the online world (“Logout”), the crowd was with him the entire way, moshing and shouting every word back to him. While he may not have reached Chance’s level of popularity, Friday’s set made you think that Saba is not too far behind. Syd (formerly Syd Tha Kid), another former Odd Future member, followed Tierra Whack on the green stage. Compared to Whack’s high-energy set, Syd’s performance was relatively demure. The singer, dressed in a white t-shirt and patchwork jeans, slinked around a stage that did not include anything more than a white background and a few lights. She ran through a number of songs from her excellent 2017 record Fin as well as Kaytranda collaboration “You’re The One.” She even brought out members of her band the Internet to perform a few songs off their album Hive Mind, that was released earlier that day. After Syd, it was time for a break. Luckily, the festival offered plenty of options for those looking to give their eardrums a rest. CHIRP (short for Chicago Independent Radio Project), the volunteer-driven, independent, community radio station, set up a pop-up record store so festival-goers could pick up a copy of any other the Pitchfork-approved artists they were seeing that day. The American Poster Institute set up a sale for those looking to find something to decorate their man caves with and food-wise you could have anything from a cheeseburger to Chinese steam buns. Courtney Barnett headlined the red stage and gave an absolutely pummeling performance. The Australian singer/guitarist played a nearly identical set to the one she did at 80/35 a couple of weeks back and it has not lost any of its punch. There’s a power to her performance that you just are not able to capture on record. She thrashes about the stage while swinging her ax wildly, solos alongside her band members, and mangles her low notes so much that she sounds more like a growling bear than a person. Tame Impala’s headlining set was easily the most anticipated event of the day, and the festival’s green stage was surrounded by an ocean of urban hippies. 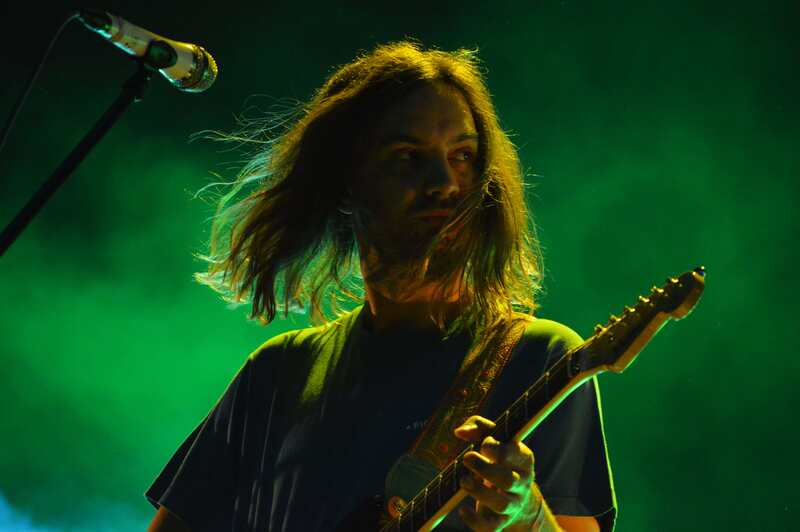 When the second group of Aussies took the stage, led by frontman and brainchild Kevin Parker, the crowd erupted in a massive round of applause. We have not heard anything new from Parker since Currents back in 2015 and Friday’s headlining set did nothing to change that. Parker and company played a set heavy with songs from that record. They walked out to the synth-heavy “Nangs” before jumping into “Let It Happen,” the album’s opener. At over seven minutes, it was an ambitious first song that featured multiple synth parts, vocal harmonies, and a fuzzy guitar solo that coincided with an explosion of confetti. While Tame Impala has never been the most engaging band watch (usually they are a little boring if I’m being honest), they always sound fantastic. It is not often that you go to a show where you see some people dancing wildly while others are staring in at the stage in an edible-induced trance and neither one of them looks out of place. Parker’s music makes this possible. The sly funk of tracks like “The Less I Know The Better” and “The Moment” mix beautifully with spacey epics like “Apocalypse Dreams” and “Alter Ego.” It was a solid final set and after nearly nine hours of music, everyone left in a dream-like state, excited by what they had just seen and what they would see in the days to come. Everything I Needed to Know I Learned from ‘60s MusicTwo New Places to Get Your Fix!